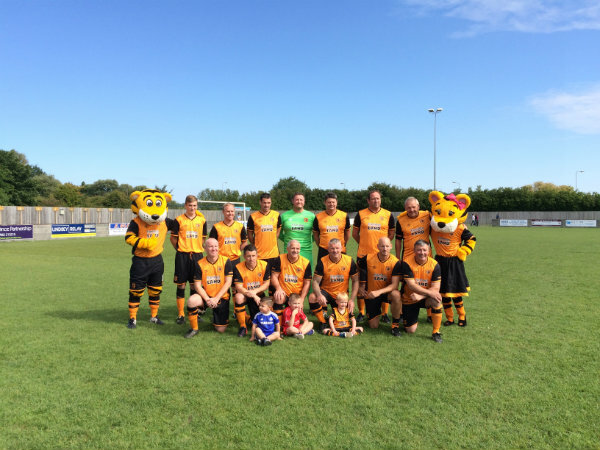 You are at:Home»Charity»Wren vs Hull City Legends… The Result! 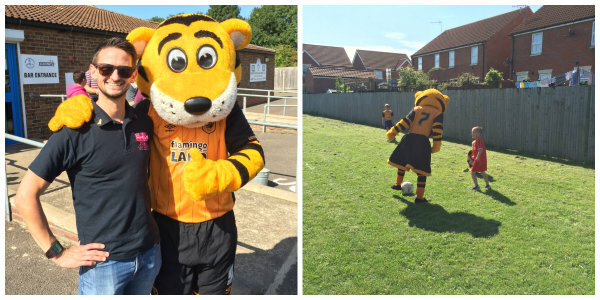 We also had some very special guest appearances from official Hull City mascots, Roary and Amber! They kept all the little ones entertained, and were their usual cheeky selves! 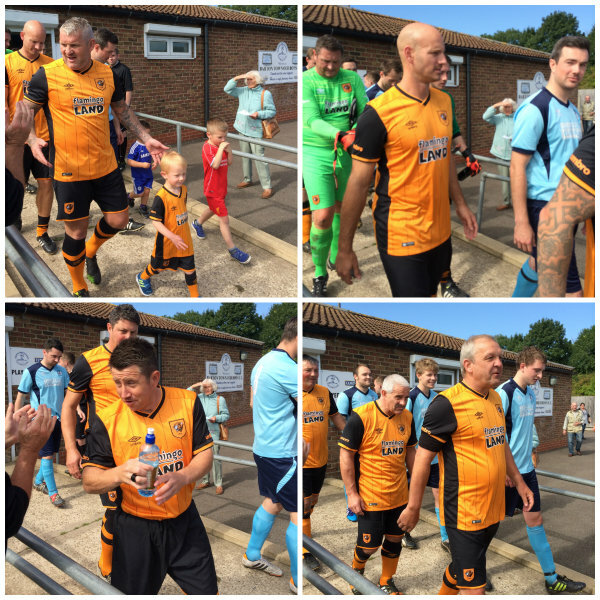 Hull City mascots Roary and Amber made special guest appearances – keeping the kids (and CLIC Sargent Stephen) entertained! Our 150ish spectators were thoroughly entertained, and our Wren boys didn’t fail to impress with their sheer determination to give the legends a decent run around! The score at half time was 1-0 to the legends, thanks to a free kick from Ryan Williams, with a strong defense formation in place from our Wren team. 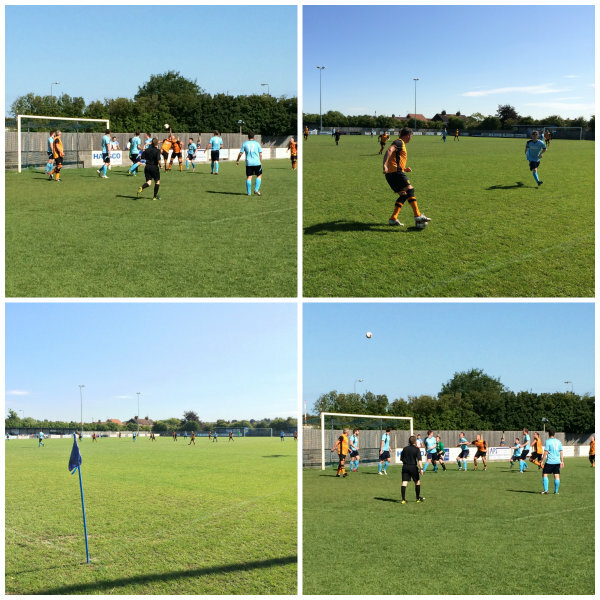 A change in tactics in the second half led to the legends scoring a further 3 goals, giving Ryan Williams a hat trick and Dean Windass netting the other. 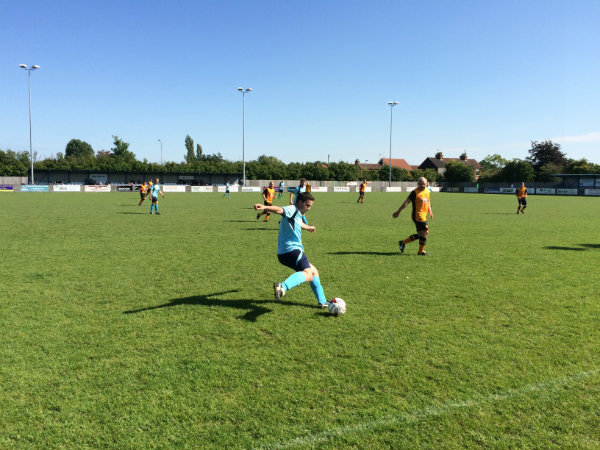 Our own Luke Briggs (Training Team) scored the goal for Wren which was met with a roar of cheer from the crowd, leaving the final score at 4-1 – not bad! Great shot of Josh Hopkin about to strike past the legend Peter Skipper! 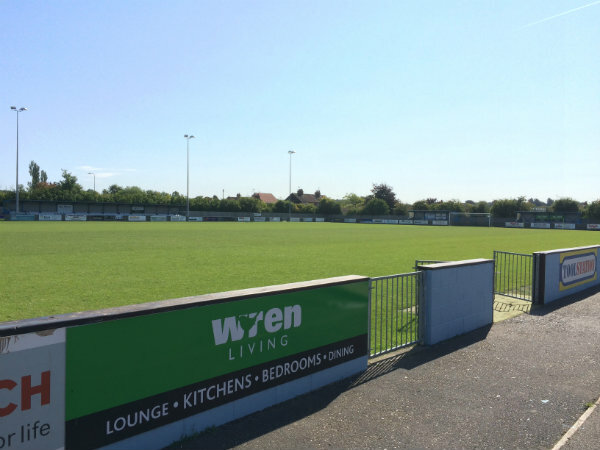 As you know, this charity football match was all in aid of CLIC Sargent, so as well as charging a few pennies on the gate, we arranged a raffle with some fab prizes, and nearly sold the whole ticket book! There was a signed Hull City shirt up for grabs, and one of our porters here at Barton was lucky enough to scoop this top prize, presented here by Lawrie Dudfield. We also gave away a signed City ball, Flamingo Land tickets, local hairdresser Xandria’s vouchers, local restaurants Harrison’s and Gin Gin meal vouchers, a DAB radio from Lindsey Relay electronics shop, a nail polisher and buffer worth £40 from Lloyds Pharmacy and lots of wine and sweets! 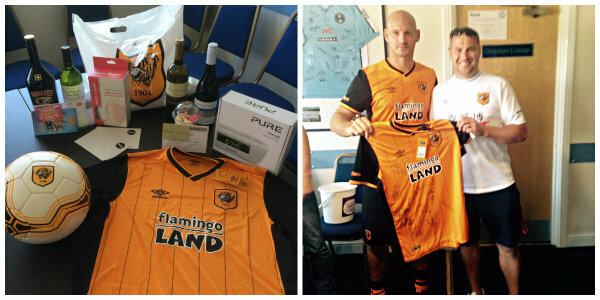 We ran a fab raffle on the day, and our very own Alan Spittlehouse nabbed the signed City shirt! 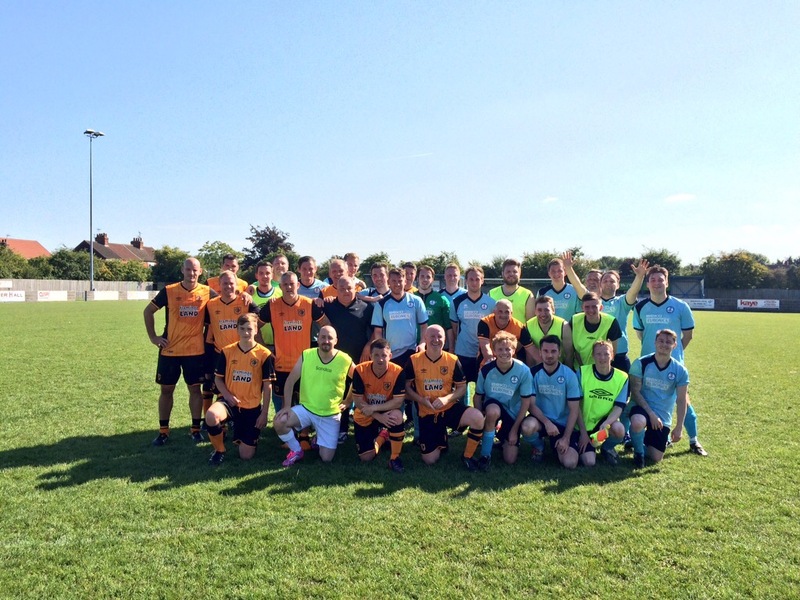 We managed to raise a whopping £660.32 on the day, with players donating £10 to take part, and the proceeds from the gate entry and raffle. 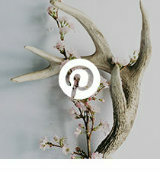 We’ve also secured (so far!) £2,500 in sponsorship from our generous suppliers Frederick Thomas, Meredith Group, Sapphire Signs, Biffa and Hobson & Porter. 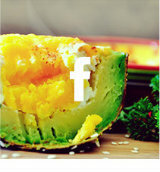 If you’d like to donate, you can do so on our Just Giving page. We’ve had some fantastic feedback from members of staff and locals who attended, so we’ll definitely be looking at regular ‘battles of the boots’… And of course, it’s the perfect opportunity to raise valuable funds for our chosen charity (as well as rallying up some friendly competition between team members!). No hard feelings, ‘ey Deano & Co.?